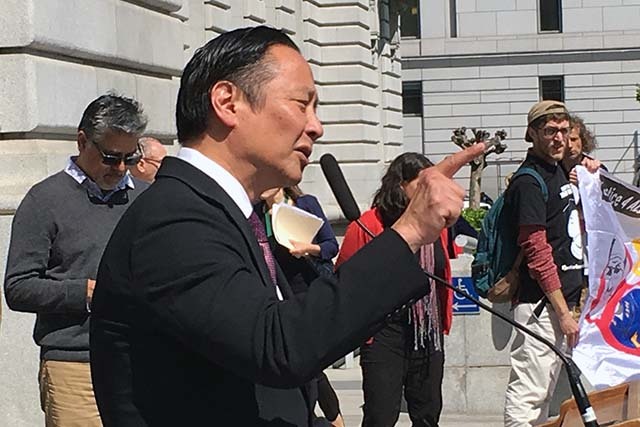 Following a letter to California Attorney General Kamala Harris last week, Public Defender Jeff Adachi vowed to continue demanding a state investigation into the practices of the San Francisco Police Department, which he said are plagued by racial bias, use-of-force violations and a lack of transparency. Adachi was joined on the steps of City Hall by several city supervisors, District Attorney George Gascon, and leaders of various activist groups challenging police practices during an April 13 press conference addressing a string of shootings at the hands of the police department over the past two years. With the power to institute an investigation of any law enforcement agency in the state that has violated the civil rights of a citizen, Adachi said that involvement by the attorney general was crucial. “We are putting all this time and hope into these efforts that are going to result in nothing. That’s why we are making it clear today that we want the attorney general to take a stand,” he said. The press conference took place just an hour before a town hall meeting was held by the Police Department to discuss officers’ involvement in Gongora’s death. Amid protesters’ calls for the resignation of Police Chief Greg Suhr, the city leaders promised unity and action in enacting policies that will result in substantial changes. All of Wednesday’s speakers called for an independent civil rights investigation and a reform to police use-of-force policies. Schlosser called the ongoing review of police department practices by the Department of Justice “completely inadequate.” Echoing Adachi’s demands for involvement by the attorney general, Schlosser accused the police department of “distorting evidence,” adding that an “enforcement mechanism” is needed to address a lack of transparency within the department. Yesterday, Supervisor Malia Cohen introduced legislation tasking the attorney general’s office to initiate a civil rights investigation into the city’s police department. “Rallying and holding protests means nothing if we don’t produce results,” said Cohen. Campos challenged the officer’s compliance with this order when they shot Mario Woods, who was carrying a knife, on December 2, as well as the narrative Suhr gave reporters last week following Gongora’s death. Suhr said then that Gongora lunged at officers with a knife in the homeless encampment where he lived, but his narrative has been disputed by seven witness statements. Video footage of the incident showed that officers approached and killed Gongora in less than a minute. While questioning Mayor Ed Lee’s leadership in addressing the city’s “police crisis,” Campos said that unity between City Hall and the community is necessary in enacting reform. Campos said that homeless activists should also be included in this movement. “The mayor’s response to the killing of a homeless person by the police department has been to crackdown on the homeless,” said Campos. Following last week’s shooting, Lee ordered the dismantling of homeless encampments throughout the city. As the press conference concluded, some protesters headed towards the Mission where the town hall meeting for Gongora was held shortly after. Several protesters questioned the police department’s motive behind scheduling the public meeting at noon, making it difficult for many members of the public to attend. “To hold a community meeting about this shooting in middle of day, doesn’t send the right message,” said Campos.